Note : Thanks and credit to Arvind Ramani (@arvind_ramani) for adding the Management row. The world of work is changing and with it company cultures and management practices. Most businesses today are still operating using methods that are best suited to the past. Re-enforced by yesterday management teachings or yesterday’s successes, some habits die hard. Digital disruption, globalisation, cheaper and accessible education with scalable services are demanding that businesses rethink their organisations in order to stay alive or ahead. 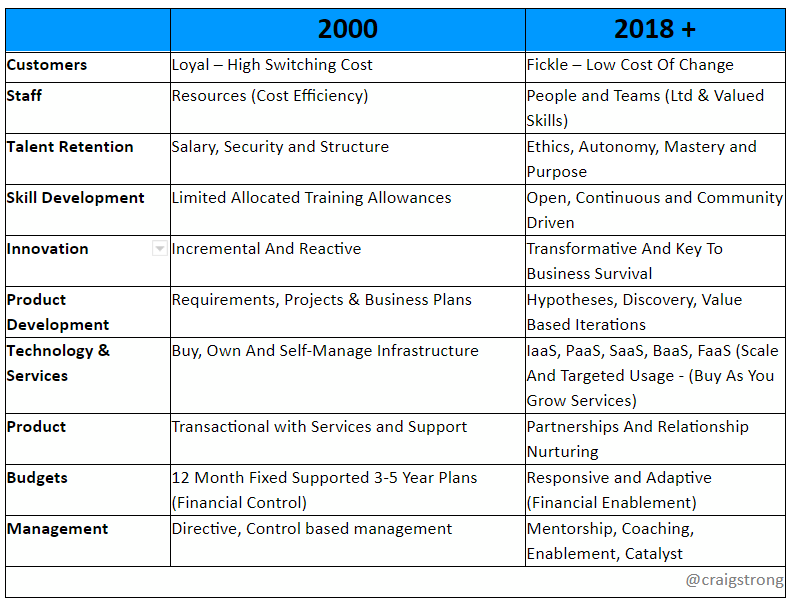 I have highlighted some areas which have changed in recent times which are still evolving rapidly. Many customers are tribal with choices, re-enforced by their expectations being met consistently and a sense of belonging. However don’t let that fool you. As competitors surface with new offerings and artful ways to ‘eat your lunch’ and kill your companies cash cow, customers are more willing to try alternatives with trends and difference. Moreover they are rewarded for doing so with social kudos, shared on social networks. With this increased competition and more of a willingness to change, the pressure on customer retention is high. Customers are fickle today and will be more so ahead. Companies need to therefore improve the quality of products and services that support it at every touch point to limit the intent to leave. Much of the modern working environment and behaviours we observe today originated from the Victorian period and the industrial revolution. Although conditions have no doubt improved, moving away from the 14 hour workday of then with no benefits, little workplace safety and little or no health care, the principle divide of ‘Us and Them’ still exists. Companies who are leading the way see more value in teams and people as this yields results in output and creativity. Workplaces are finally getting more diverse and balanced on this front, where the best companies pioneering and leading such environments, attract and increase retention of the best talent. Over the last decade a realisation has surfaced that companies need to innovate to survive. Innovation is seeked in the culture of organisations and enterprises, no doubt influenced by the birth of the new dominating and leading giants such as Amazon, Apple, Alphabet, Tesla and More. Many enterprises used to look for incremental profit and growth are now being suddenly disrupted or displaced by relatively new competitors. As a response to this, Innovation strategies are at the top table of most large organisations, realising innovation isn’t just about growth, but innovation is about survival. Product development was once dominated by a linear based waterfall methodologies from inception to delivery. Although hypotheses driven and adaptive management practices existed for some time, products development generally followed a linear path. This attempted to predict outcomes in a complicated domain; seldom resulting in efficient results. Over the past 2 decades with the movement driven by Agile, Lean and Lean Startup communities, this has successfully challenged this approach. Realising the complexity and risks resulting from linear development, product development has embraced a more discovery based, iterative approach. Such practices move away from knowing what the customer wants, to discovering customer needs and better understanding the customer jobs to be done. Practices have and continue to evolve, transferring the balance from believed assertions to assumptions which need to be validated and supported by experimentation and feedback. The symbiotic relationships between technology, business models and shifts in societal behaviours and been groundbreaking over the past two decades. Most companies 10-20 years ago had to invest heavily upfront in infrastructure, skills and services with minimum spends. Scaling such was a privilege of those with the biggest bank accounts, making the barriers to entry for new entrants and SME’s high. Companies today are shifting from ownership to shared services and in doing so have access to technology and platforms which would have been previously unreachable. 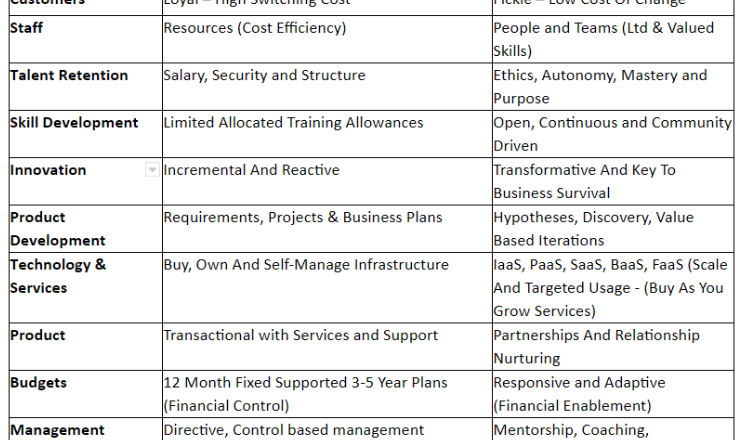 Looking at the advancement and cost reduction of 3D Printing, technology platforms such as those offered by GCP, AWS and Azure and the range of services and solutions offered through different models IaaS, PaaS, SaaS, BaaS, FaaS, businesses today can access a wealth of assets which are immediately scalable on simple pay and buy as you grow contracts. This has vastly reduced the investment needed upfront, allowing fast growing companies to quickly and fairly compete with giants and capitalise on opportunities. Most products and particularly digital products are living entities which need to be continuously nurtured. Even physical products are supported by digital services and such services need to continuously keep up with the trends on mobile platforms, changing behaviours and social interactions. Long gone are the days where products were transactional. Customers today buy a product and expect that product to keep maturing and refining itself with the times. One of the biggest issues enterprises face today is the application and management of the annual budget. Innovation and growth requires a fundamental shift in budgeting and management. Enterprises who wish to grow and innovate should consider the duality in funding new ideas differently to managing mature products in the portfolio. Companies are beginning to change how they fund innovation and growth in a much more dynamic way. Such structures should be applied to invest into new ideas and opportunities, not subjected to the same efficiencies and expectations as a traditional budget. Growth companies are beginning to position capital distinctly into areas of innovation utilising a fund based approach to transformational, adjacent, and core innovation. As with the evolving changes in the teams and culture which has has a long heritage with the Victorian workforce, management practice is changing. Once perceived and implemented controllers of decisions in an authoritarian style, this style of management has emerged as being less effective in creative cultures. As suggested above, employees seeks a sense of autonomy, purpose and mastery and companies knowingly need to improve growth and innovation to survive and thrive. These drivers have in many ways highlighted the flaws in strict traditional management practices, which typically don’t encourage collaboration and inclusive environments. The better managers today are expected to be approachable crafts people at mentoring and coaching their teams to work together more effectively towards their goals. This means enabling teams to contribute and work together in meaningful ways, embracing diversity and harvesting and nurturing continuous contribution to yield higher value outcomes. Like everything which exists which is subject to environmental shifts, businesses need to evolve in order to survive. This pushes and improves management and culture to be better suited for the time and state. The impact of these changes are becoming more and more influenced by ethics which in turn this influences the working environments, goals and interactions. As a result, a cultural consciousness is emerging across organisations, improving innovation and operations, putting the customer at the center. In addition, more than ever the impact of our actions and ethics are becoming a key driver for customer loyalty and talent acquisition.